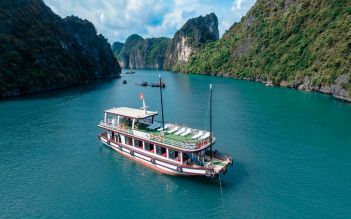 Unicharm Cruise offers 2 days 1 night for travelers who wish explore the hidden area of Cat Ba Island and Lan Ha Bay – the additional parts of the Wonder of Halong Bay and the World Biosphere reserved area. Book your trip with Unicharm Cruise today to enjoy a charming journey through this beautiful bay. Kayaking, Swimming, Cooking class, Biking. 07:45 – 08:15 optional pick up at your hotel in Hanoi Old Quarter for Hai Phong on the free-way AH 5B enjoying the landscape of rice field and rural villages of the Red river Delta. (1,5-2 hours). Enjoy driving on the longest sea crossing bridge of Vietnam heading to Cat Ba Island. 25 minutes on the ferry to Cat Ba Island where you will feel the tour starting by green mangroves running along the mountain feet. Along the coastal road for amazing views to the bay and the valley shadowed paths through the National Park for more authentic Nature to the other side of the Park is Gia Luan dock where you can obtain a great view of Halong Bay. Here we will embark Unicharm Cruise. 12:30 UniCharm crew warmly welcome you on board. Visit the boat, check in the room and enjoy your first fresh lunch on boat (We can cater Vegetarian or vegan food on your request). Lunching and cruising into the bay pass by Cap Bai Islet, Ngon Tay Island (Finger Islet), Sung Sot cave and Titop peak… (Now we are in the middle of the World Heritage site of Ha Long bay). Arrive in Lan Ha – the Biosphere reserved area of the World, is famous for its crystal water, round lagoons, tunnel grottoes and the fisherman villages…and especially phosphorescence at night time. On each 2-seat kayak our tour guide will lead you to paddle through narrow lanes of the karst mountains to fishing villages, we can visit and talk with the fisherman to get to learn more about the daily life on the sea. Enjoy the sunset on the bay. Wake up among the smooth waves (if you want to contemplate the sunrise, wake up earlier enough is important). A Light breakfast is served to energize for morning exercises by (fresh fruits, fresh fruit juices, cakes, tea and coffee or mineral water). 07:30 Tender ship to Cat Ba Island, Viet Hai dock for a bicycle trip to Viet Hai village. Afterward cycling back and tender to return to the cruise. Relaxing on board or swimming in the bay or breathing nature on the large sundeck chairs. 10:30 check out and start cruising on another route throughout thousands of limestone islands and islets, taking precious Uni pictures meanwhile enjoying our tasteful brunch. 12:00 arrive back at Gia Luan dock. 12:00 – 12:30 Disembark UniCharm Cruise for another drive on the free-way AH5B back to Hanoi. 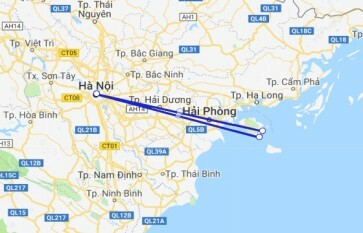 Estimated to arrive back in Hanoi at 16:00 – 16:30 – end the tour at your hotel. Booked the cruise after many hours of looking online at the 100's of different cruises they have on offer to go Halong Bay. I'm quite picky with the facilities and everything has exceeded expectations. We passed many Cruise boats in the open sea and apart from 1 mega balla celebrity yacht, the Unicruise stood out. The room was quite spacious 20m2 for a cruise, the staff paid attention to every detail you requested. The food onboard had great variety and was more than satisfactory. Most of all our tour guide Hieu was awesome. He's quite well adversed in English and he's humour makes the 3.5+ hr drive from Hanoi and back pass effortlessly. Would recommend to anyone. Wonderful 2 day 1 night cruise, swimming, canoing, cycling. Our tour guide Hieu is awesome, very funny, responsible, making our stay absolutely one of best experience in Vietnam :)) 5 out of 5 stars !